The Samsung Galaxy R I9103 managed to get a GPS lock in just under a minute without A-GPS. A-GPS can speed up the lock (but it involves data traffic). Cell-ID and Wi-Fi positioning are also available if all you need is a rough location, but they need a data connection too. 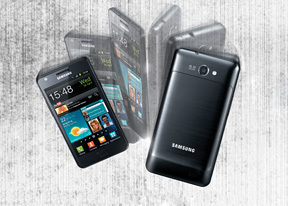 The Samsung Galaxy R has the latest version of the Android Market. Upon launch of the Market app you’re greeted with the tiled interface of the Featured window. A swipe to the right takes you to the Categories view. Swiping to the left takes you through Top Paid, Top Free, Top Grossing, Top New Paid, Top New Free and Trending (the ones with growing popularity). New sections are available such as Staff Picks, Editor’s Choice and more. The Samsung Galaxy R comes with Kies Air preloaded. The app connects to the local Wi-Fi network (or it can create a Wi-Fi hotspot) and gives you a URL to type into your computer’s web browser.